When shopping for a new compact sedan, some people tend to overlook the Volkswagen Jetta. To make this undervalued car more appealing, Volkswagen has gave it a complete redesign. Not only will the 2019 Volkswagen Jetta deliver a smoother ride, but it also offers a greater number of high-end features. A more modern interior design gives you another reason to like the new Jetta. However, does the competition still bring more to the table? The 2019 Volkswagen Jetta has been fully overhauled. This means new technology and updated styling. VW’s sports-tuned Jetta GLI model will be released at a later date. With a total output of 147 horsepower, the 2019 Volkswagen Jetta’s turbocharged four-cylinder is slightly less powerful than before. However, you won’t notice a big difference in acceleration. This car will have no trouble getting up to speed. Drivers will also enjoy the Jetta’s improved city fuel economy, which now stands at an EPA-estimated 30 mpg. Meanwhile, anticipate averaging up to 40 mpg on the open road. The 2019 Volkswagen Jetta continues to offer stable handling. Although it doesn’t hustle around curves like a sports car, you will still feel very confident. There’s definitely a good amount of body control. Families will especially appreciate the Jetta’s more polished ride. Its suspension dampers smoothly swallow up the pavement. Whether you are taking a lengthy highway trip or maneuvering around town, expect the Jetta to have a plush feel. Prices for the 2019 Volkswagen Jetta start at less than $19,500. It’s right in line with the 2019 Toyota Corolla and the 2019 Honda Civic. However, better warranty coverage gives the new Jetta an advantage. VW’s 72,000-mile bumper-to-bumper warranty will keep you happy for a long time. While several luxurious upgrades are offered, a satisfying number of features come standard. Some of the goodies consist of a 6.5-inch touch screen, smartphone integration, and a backup camera. You will find the 2019 Volkswagen Jetta to be a pleasant daily-driver. Additional knee room in the front makes the new Jetta more accommodating to taller drivers. Seat comfort is among the best in the segment. A power-adjustable driver's seat is found on the range-topping SEL Premium trim. The new Jetta also does a good job of managing road noise. Passengers can look forward to a very quiet ride. 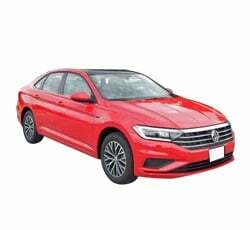 The 2019 Volkswagen Jetta is sportier and sleeker. It has an extra degree of refinement. Fresh front-end styling helps gives the Jetta a smoother profile. LED head- and taillights come standard. If you are seeking a racier look, check out the R-Line trim. This model comes outfitted with a larger set of 17-inch alloy wheels and a sportier grille. Some of the hottest colors include Habanero Orange Metallic, Platinum Gray Metallic, and Tornado red. Unlike last year’s model, the new 2019 Volkswagen Jetta comes standard with Apple CarPlay and Android Auto smartphone integration. VW’s MIB II infotainment system definitely hits the mark. It’s fast, easy to use, and concise. Drivers will also like the touch-screen display’s readability. You’ll never have to worry about straining your eyes. While the standard interface works well, the upgraded version benefits from a larger 8.0-inch display. The standard gauges are simple and easy to see. However, don’t hesitate to opt for the Digital Cockpit display. This fully digital gauge cluster can be customized to your liking. It can display data such as your speed, estimated fuel efficiency, and safety information. Travelers will especially enjoy the Digital Cockpit’s full-screen navigation. High-resolution maps help you to easily stay on the correct course. When equipped with the all-new Beats premium sound system, the 2019 Volkswagen Jetta becomes a more entertaining ride for music fans. It’s the most impressive audio system ever offered in the Jetta. A 400-watt amplifier helps ensure incredibly clear sound. If you like your music with extra bass, the system’s trunk-mounted subwoofer will deliver the desired boom. You will never want to go back to the standard four-speaker system. This year, even the base Jetta SE can be equipped with a Driver Assistance package. This package is designed to make your commute safer. Featuring a front radar detector in the front, forward collision warning with automatic braking constantly monitors the traffic. Meanwhile, the blind-spot monitor tells you when it’s safe to change lanes. Rear cross-traffic alert is designed to work in unison with the blind-spot system. Not only does the 2019 Volkswagen Jetta R-Line have a sporty look, but it also delivers a sportier driving experience. It comes standard with a special XDS system. When aggressively taking curves, XDS can gradually apply braking pressure to the inside front wheel. The result is a car that offers more precise cornering. The 2019 Volkswagen Jetta is strictly a front-wheel-drive car. While the Jetta offers cold weather features such as remote start and heated windshield washer nozzles, you won’t be able to get an AWD system. As you know, all-wheel drive dramatically improves traction on slippery road surfaces. If your area tends to experience a lot of snow during the winter, consider the 2019 Subaru Impreza. It’s ranked among the best AWD sedans on the market. Although a more potent GLI model is on the way, it’s currently absent from the lineup. This means buyers must settle for the base engine. Despite the sedan’s fulfilling performance, some drivers will demand more power. It clocks a 0-60 time of roughly 8.3 seconds, which is a bit slower than some competitors. If you can’t wait for the GLI model to arrive, check out the 2019 Honda Civic Si and the 2019 Nissan Sentra SR Turbo. Don’t expect the new Jetta to deliver a high level of driving excitement. Although this sedan feels lively enough for most people, others will describe the Jetta as having a docile personality. It doesn’t feel nearly as sporty as the Honda Civic and the Mazda 3. It is focused more on comfort opposed to appeasing driving enthusiasts. However, keep in mind that the R-Line does benefit from a new XDS feature. Volkswagen has updated the Jetta’s exterior styling. Nevertheless, it still has a conservative look. Most people on the road will not give the Jetta a second glance. If you want to attract more attention, get the slightly flashier R-Line model. The Volkswagen Jetta is a safe car. However, you must pay extra for driving aids like blind-sot detection and forward collision warning. Both the Honda Civic and the Toyota Corolla now come standard with an advanced safety package. The 2019 Volkswagen Jetta goes against the top-selling Toyota Corolla. From a performance standpoint, you’ll find the new Jetta to be more powerful. However, a reputation for being reliable gives the Corolla an advantage. It also comes standard with advanced safety features. Some people consider the Honda Civic to be the best compact sedan for the money. It’s certainly more entertaining to drive than the Jetta. However, you can’t overlook the Jetta’s better warranty. Some car shoppers will be looking at the Ford Focus as well. While the Focus is a good car, it doesn’t provide as much passenger room as the Volkswagen Jetta. On the other hand, the Focus does offer a hatchback body style. While the 2019 Volkswagen Jetta is unlikely to match the Toyota Corolla or the Honda Civic in sales numbers, it’s still a solid compact sedan. It’s easy to drive, efficient, and comfortable enough for most families. Several premium upgrades are now offered, including VW’s Digital Cockpit gauge cluster and ventilated leather seats. Drivers who desire a more powerful version of the Jetta will have to wait.